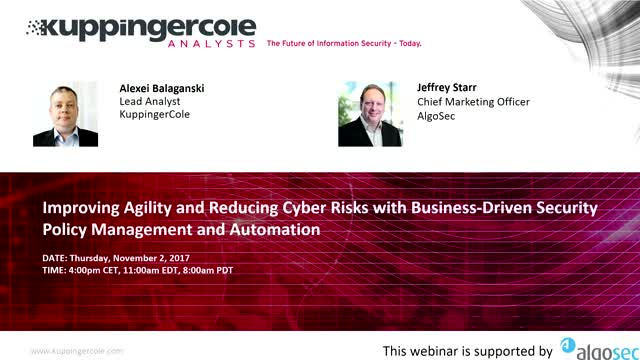 KuppingerCole Analysts, Alexei Balaganski and Algosec CMO, Jeffrey Starr discuss how to improve agility and reduce cyber risks with business-driven security policy management and automation. Many enterprises are moving to Cisco’s next generation firewall, Firepower, which offers unique capabilities - including Next Gen IPS powered by Snort and Advanced Malware Protection (AMP). However, migrating current security policy to Cisco Firepower is often complex, time-consuming and prone to errors. A single mistake could, potentially, cause outages, compliance violations and security gaps. In this webinar Doug Hurd, Security Technical Alliances at Cisco and Yonatan Klein, Director of Product Management at AlgoSec, will explore the benefits of Cisco Firepower, how to simplify and accelerate the migration process with AlgoSec, the challenges associated with managing the holistic network, and how AlgoSec can help manage security policies across your disperse network. Good old perimeter security, enforced by traditional firewall protection, is now combined with distributed firewalls, public cloud native security controls and third-party security services. The shared-responsibility security model means that IT organizations need to assume accountability for the data and overall security posture, as this is not exclusively the cloud providers’ responsibility. Today, more than ever, enterprise security teams are challenged to stretch their tried-and-true security policies to their extended deployments. They lack visibility across this growing estate, they can’t keep up with DevOps, and they are unable to properly analyze risk. They need integrated security policy management solutions for hybrid-cloud environments. Join Yonatan Klein, Director of Product Management at AlgoSec to learn how to take advantage of all the benefits of cloud and virtual deployments while maintaining your current security fundamentals. Financial institutions are forced to invest heavily in digital transformation to gain a competitive edge, especially with customer-facing technology innovations. However, delivery often trails behind the need. New apps are developed, but network security policy management is often perceived as holding up progress, impeded by manual change-management processes, growing compliance requirements and never-ending audits. There’s a better way to manage your network security! Watch our special panel discussion to learn how you can simplify your network security management, reduce risk and ensure continuous compliance. As cyber threats become more sophisticated, companies of all sizes are struggling to stay secure. Regardless of how many different firewalls you use, it’s merely a matter of time until a threat gets through. To prevent serious breaches, networks must be internally segmented to stop hackers moving freely inside the network and exfiltrating data – but network segmentation must be designed and managed correctly if it’s to be successful. This webinar will examine how to build a micro-segmentation strategy that truly protect your organization’s valuables. The growing body of regulations and standards forces enterprises to put considerable emphasis on compliance verified by ad hoc and regular auditing of security policies and controls. While regulatory and internal audits entail a wide range of security checks, network firewalls are featured prominently as they are the first line of defense of the enterprise network. Typical networks might include tens or hundreds of firewalls from multiple vendors running thousands of rules. Auditing firewalls for compliance is becoming more complex and demanding all the time. It’s time to adopt auditing’s best practices to maintain continuous compliance. Join us in this webinar to discover the Firewall Audit Checklist, the 6 best practices that will ensure successful audits and full compliance. By adopting these best practices, security teams will significantly improve their network’s security posture and reduce the pain of ensuring compliance with regulations, industry standards and corporate policies. Are you getting the most out of your Security Policy Management Solution? Today’s security policy management solutions do much more than automate traditional change management tasks. And yet, managing processes is becoming increasingly complex, time consuming and riddled with errors. Many professionals believe they need additional sophisticated tools to address these challenges. However, you may already have what you need, up and running in your organization. Are you still implementing firewall changes manually? Are you still trying to keep track of all the changes and their ramifications with spreadsheets? Network security policy automation gives you quick, accurate change management across even the most complex hybrid networks, avoiding security holes, compliance issues and costly outages. With automation, you don’t have to choose between agility and security. You can have both. In this webinar, Yoni Geva, Product Manager at AlgoSec, explains how security policies can be updated automatically and accurately. The traditional network is bursting at the seams. Good old perimeter security, enforced by traditional firewall protection, is being joined by distributed firewalls, public clouds and a shared-responsibility security model. But as they adopt the new model, enterprises are challenged to stretch their tried-and-true security policies to their extended deployments. They lack visibility across the growing estate, they need integrated security policy management solutions for hybrid-cloud environments. They can’t keep up with DevOps, and they are unable to analyze risk. In this webinar, Yonatan Klein, Director of Product Management at AlgoSec, shows you how you can use a single, comprehensive Network Security Policy Management solution to extend security posture with one map and point of control for on-prem, cloud and virtual deployments. Enterprises are not only migrating applications to the cloud from on-premise data centers, but they are developing multi-cloud strategies to take advantage of availability and cost structures as well as to avoid vendor lock-in. In fact, IDC has predicted that more than 85% of IT organizations will commit to multi-cloud architectures already by the end of this year. In complex, multi-cloud and hybrid environments, security teams need to understand which network flows and security controls impact application connectivity, including cloud-specific security controls (Network ACL and security groups) as well as virtual and physical firewalls that protect cloud resources. They need to manage policies that maintain their compliance posture across multiple clouds and hybrid environments. As their first big move into the Age of the Cloud, enterprises are rapidly migrating applications from on-premise data centers to the cloud to take advantage of agility, segmentation, scalability, flexibility, cost and other benefits. While migrating the storage and compute is pretty straightforward, migrating the SECURITY presents unique challenges that cause enterprises to struggle with application connectivity and management of the cloud security controls alongside their traditional firewalls in a secure and compliant way – and quickly. In this webinar, Omer Ganot, Product Manager at AlgoSec, provides technical insight and best practices for discovering, mapping and updating network security policies to provide a smooth application migration that assures proper operation and security. 83% of enterprise workloads will be in the cloud by 2020. Migrating the storage and compute is the easy part. Migrating the SECURITY is the part that you have to get right – unless you don’t care about outages and cyberattacks. Don’t struggle with application connectivity and management of cloud security controls. Automate the entire process and get it right. Financial institutions must contend with the big three challenges of digital transformation, cyberthreats and regulations. Always seeking a competitive edge, financials invest heavily in digital transformation, especially customer-facing technology innovations, but delivery often trails behind the need. New apps are developed, but network security policy management is often perceived as holding up progress, hampered by manual and error-prone change-management processes. Errors in network security management procedures also expose institutions to unreasonable levels of cyber risk. The growing body of demanding regulations burdens financial institutions with severe compliance requirements and never-ending audits. Our latest webinar shows financial institutions how to make the triple play by automating network security policy management changes, at once enabling the business, reducing risk and enforcing compliance. IT must deliver more, faster. Yet as cyber-attacks increase in volume and sophistication, IT groups are finding themselves ill-equipped to secure their networks and maintain compliance while supporting business productivity. In this era of digital transformation, managing security across complex enterprise networks presents huge challenges. Automation will ease the pressure. Join Kyle Wickert, Worldwide Strategic Architect at AlgoSec, for a technical webinar on tips and best practices to help you select the right security policy management solution that will help drive business agility while ensuring security and compliance. Deployment of business applications is becoming more agile by the day. Organizations are rapidly adopting SDN solutions, such as Cisco ACI, to reduce provisioning time. Learn how you can seamlessly integrate and extend network and security policy automation for Cisco ACI to all security devices across the enterprise network, inside the data center, at its edges and in the cloud. Join Jonathan Gold Shalev, Senior Product Manager, to understand how to harness the power of Cisco ACI with a holistic, business-driven, security-management approach covering all the organization's network security controls. AlgoSec is the market leader for security policy management, enabling organizations to simplify and automate security operations in evolving data centers and networks. More than 1,500 of the world’s leading organizations, including 15 of the Fortune 50, rely on AlgoSec for faster security provisioning of business applications, streamlined change management, continuous compliance and tighter security.